And by now you’ve probably guessed where I got the animations from. 😉 That’s right: the toy box! This means that I’ve had to scale the chests down some compared to the TSM originals, to make them closer in size to the toy box so that the anims would work, but I’ve tried to find a balance between making the anims look good and retaining the original TSM look. But enough about that. On to the chests! will be in Incendiary since I had a change of heart about the colour – after I’d finished taking the screenshots, of course. I’m sure you know the drill by now: All of the chests come in Pooklet’s naturals + Time Bomb. Also, all the metal bands have four recols: CuriousB’s Custard (gold), Jet (black), Steel (iron) and Terracotta (copper). Well, except for when the original bands were black or grey – then I’ve skipped Jet/Steel. …and finally, the Seljaq-Ghazhadid Lacquered Chest for $210. Since these are chests where you open the top, and not dressers where you need space to pull out drawers, the footprint is just one tile. This means that you can save space by placing it adjacent and perpendicular to a doorway without problems – even if your Sims of course still need a clear path to be able to reach into it. This entry was posted on 1 July, 2014 at 19:09	and is filed under Animated, BUY MODE, CONVERSIONS, DOWNLOADS, Dressers, Medieval-ish, Objects, THEMES, TSM. You can follow any responses to this entry through the RSS 2.0 feed. You can skip to the end and leave a response. Pinging is currently not allowed. These are really nice! And using the toy box anims was a stroke of genius. Thanks, Nix! You are amazing! I love that you have taken these objects beyond just being deco items. Thank you, Johanna! Brilliant! A great addition to our medieval homes. Thank you! I’m glad you can find use for them! 🙂 And that’s one of the nice things about TSM, the objects usually have quite reasonable poly counts when you convert them for TS2. Thank you! These are great, because while the other set of TSM chest-dressers I use have deco slots (always nice), the deco slots seem to hover at around Sim eye level. Just wanted to say that I love how you animated these. It made me do the happy dance 10 times over! Just read your other comment (in the Animated Orrery thread) and thought I’d slip this in here. 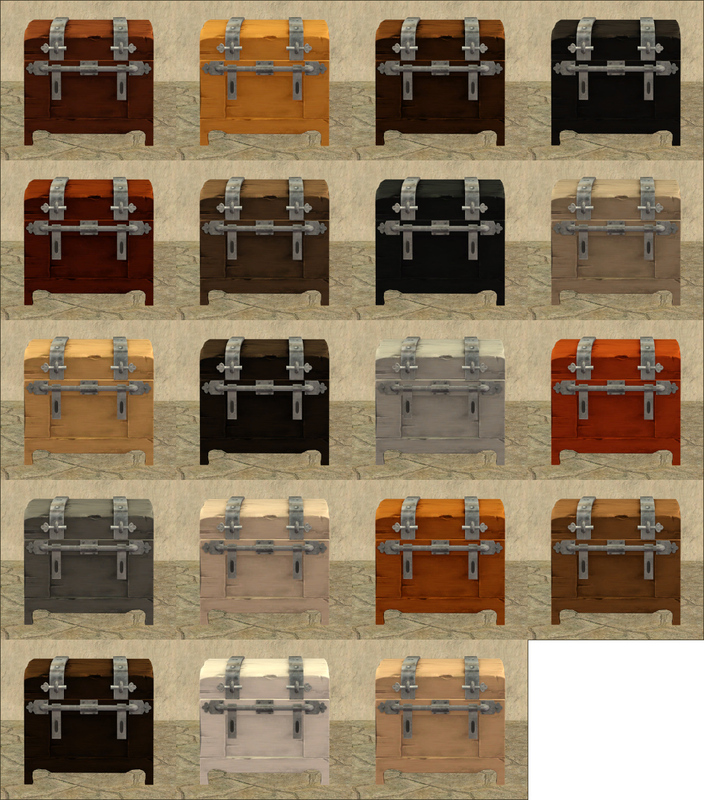 I’d love the overlay (transparent) textures and textures for these chests. 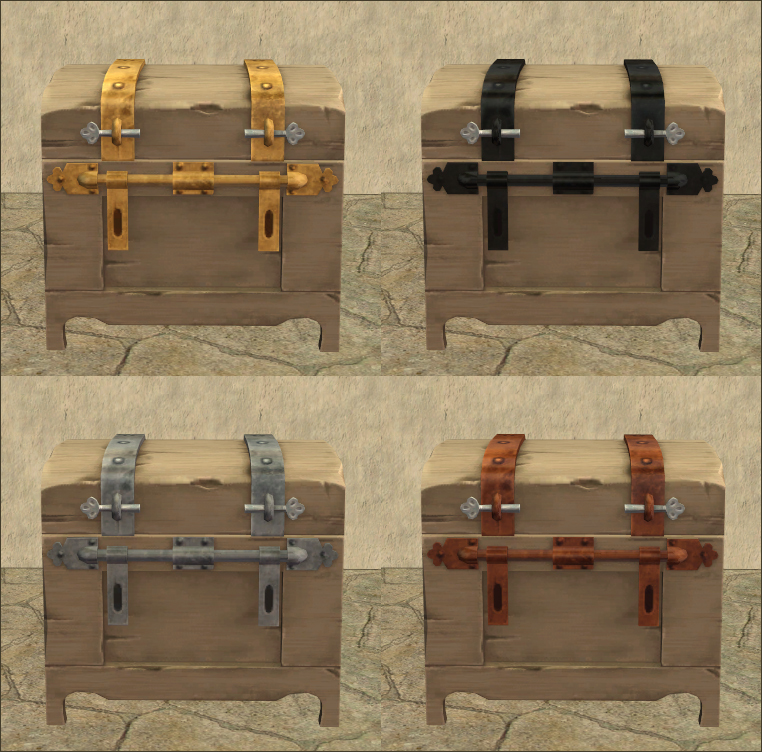 I’m on a bit of a recolouring spree at the moment and it ends with these chests! I just wanted to add 5 retextures that match my current projects to one or two of these (namely the Cryptastic and the Seljaq). If you see this before mid September, I’d love to have them. If not…not a major deal. I’ll work around it for now and add them later. Anywho…Thank you for these renditions! 🙂 Hope your away from Simming time is restful and restorative! Thank you! 😀 It made me really happy when I realised the toy box had just the animations I was looking for, it saved me a lot of trouble. The e-mail was correct, but unfortunately there was no attachment. But, it’s alright…I created a mock overlay just to see if I could (as without an overlay…the chest has more of a artisan woodsy, sort of unfinished feel to it). While I love that look for other purposes, I wanted more of a worn look. So…necessity became the mother of invention and I cranked out about 7 recolors (which I will share on PBK once I concur this Philosopher’s Guild lot. It’s finished, but I am cleaning, downsizing and testing it thoroughly…since I did not make the deadline with it. Thank you for your efforts. I appreciate your taking the time to respond to me during your hiatus. I really appreciate this. Just wanted you to know that I did receive the message and that I have it all sussed out now! And thank you. ❤ I am taking care of myself, I promise. 🙂 I'm in physical rehab right now, for this chronic disease I have, and so far it's going great – but it's also draining, both physically and mentally, so I don't have much energy left for other things like simming. I still try to maintain a bit of an Internet presence (and answer comments), though, just so people don't start wondering where I am and/or think I've left the community for good.